241 people in our community are currently praying with you. Pastor Dewey Smith gets everybody going with an old gospel song. 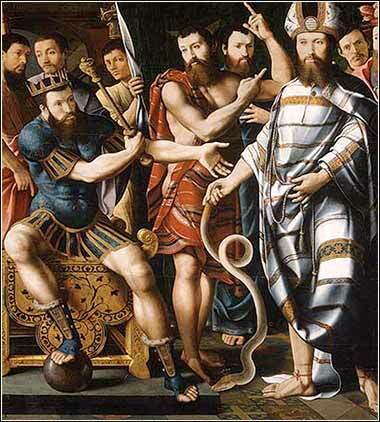 Moses and the Snake, artist unknown. For I should like to remind you, my brothers, that our ancestors all had the experience of being guided by the cloud in the desert and of crossing the sea dry-shod. They were all, so to speak, “baptized” into Moses by these experiences. They all shared the same spiritual food and drank the same spiritual drink (for they drank from the spiritual rock which followed them, and that rock was Christ). Neither should we give way to sexual immorality as did some of them, for we read that twenty-three thousand fell in a single day! Nor should we dare to exploit the goodness of God as some of them did, and fell victims to poisonous snakes. Nor yet must you curse the lot that God has appointed to you as they did, and met their end at the hand of the angel of death. Now these things which happened to our ancestors are illustrations of the way in which God works, and they were written down to be a warning to us who are the heirs of the ages which have gone before us. So let the man who feels sure of his standing today be careful that he does not fall tomorrow. Paul describes the eternal war between God and the temptations of the human mind, using the Exodus as the framework for showing how powerful temptation may be. We sometimes hear people with a difficult decision say that they wish they had "a sign from God", but they are kidding themselves. The enemy is always with us, and does not lose his power simply because we are baptized, or witness a miracle. If there was ever a group of people who got a sign from God, it was the Hebrews leaving Egypt. Aside from the florid account of the Exodus itself, the Hebrews in the desert were given a miracle every day, for they were fed in a place with no source of food, and water was given to them in a place that was, by definition, utterly dry. God rose before them as a pillar of smoke to show them their path. Paul's assertion that "many of them left their bones in the desert" because they failed to follow God's law, even in the direct vision of daily miracles, is an understatement. Of the men who left Egypt, only Aaron and Caleb reached the Promised Land. Even in the direct face of repeated miracles, the tribe devolved into lechery, idolatry, and who-knows-what-all. And the Corinthians, similarly, had let themselves slip into pride, lust, greed, and idolatry. But how about us? Where are our miracles? We don't wander in a desert with God raining food down upon us. Except, of course, we do. Did we make the soil, the rain, the sun, the air, or the corn and wheat? But even so, we do not have a pillar of smoke leading our way. Except, again, we do. God is not leading our bodies to a place, as he did with the Hebrews. He is leading our hearts, minds and souls to a place where we can love Him and be saved, and our pillar of smoke is the Bible, which will guide our way every day and night. Matthew 5:43-44: “You have heard that it used to be said, ‘You shall love your neighbor’, and ‘hate your enemy’, but I tell you, Love your enemies, and pray for those who persecute you, so that you may be sons of your Heavenly Father.